What makes couples having an healthy, strong and confident differs from person to person. What works for me and my partner sometimes can not work for other couples. Anyways, I came up with this blog post as it is a topic that I always like to read about. So I will share with you some things that I believe that are essential to maintain a good, health and strong relationship. I think we all try to do this. We don’t like something about them – how lazy they are or untidy – and we try to change it but we can’t. And we shouldn’t. First, they never will change because we want to. And then, trying to do it will only make you feel upset and him as well. We should just go with the flow.. it is normal not to like something about them, that doesn’t mean that you don’t love him. And nobody is perfect. And believe me that when you think that you know him 100%, then you start living with him and you find out things that you probably never dreamed off and also you discover tiny little things about it that annoy you even more but.. you still love him. And all you have to do is communicate. As I was saying before, all you have to do is communicate. You can’t change him but you can and you should tell him about the little things that he does that annoys you. You are not trying to change him but at least he is aware and he most likely won’t do it as often. And I think that the biggest thing for a healthy and strong relationship is really the communication. He won’t know what he did wrong if you don’t tell him. And he won’t know how you feel or what is wrong with you if you don’t talk to him about it. So communication is the key. I tell my boyfriend everything that I feel like I should tell him. And I do think that our relationship works better doing so. And also with communicating comes listening. Listen to what he has to say to you. Mutual respect is something that should always exist. And I don’t believe that I have to write that much about it so you can understand. Where there is love, there is respect. So if a relationship is lacking respect, I am afraid that it will never work. Or maybe the couple will believe it will but they won’t feel happiness while living a relationship like that. Do you agree? You don’t have to spend the time with each other 24/7 to have quality time. Sometimes, the little things are the ones that matter. Some weeks I don’t even see my boyfriend apart from that little hour and an half that we both get back from work, have dinner and go to bed. And I love that we can still have some quality time together like that. I love when we get into bed and catch up with what happened all day and laugh about every little thing. Even now that I am writing a blog post and he his here next to me playing PS4 is quality time. So keep that in mind: quality time instead of quantity. As you need time together, you need time apart. I find that in the beginning of our relationship I always wanted to be close to him. And I think that is normal when you are starting to date someone. Now, I find that being apart is as important as being together. Even when we are both off, at home, we spend time apart. He does things that he likes – playing PS4, of course – and I do things that I love like playing guitar of blogging. This is just an example as there are many more. Allow yourself to miss him and him to miss you too. I am not saying not to argue at all because that is important too. But there are things that are worth arguing about and others that aren’t. Sometimes me and my partner have little arguments that don’t even make sense and we notice that because then we don’t even remember what we were arguing about. I think that this happens to everyone and I am not saying that it is not healthy but I know that we are happier when we avoid those little arguments. Sometimes this can happen if we are on that time of the month (at least I get annoyed so easily) and also if you both spend so much time together. That can happen too. And again, it is not that you don’t love each other anymore but that is just how we work. If me and my partner have 4 or 5 days off together and it is raining so bad all of those days that we can’t even go out to do something fun and different, I notice that we annoy each other a bit more than usual. So even when closed at home together, we try and spend time apart doing things that each one of us like to avoid little non-sense arguments that just kill the romance for that full day. So here you go lovelies. 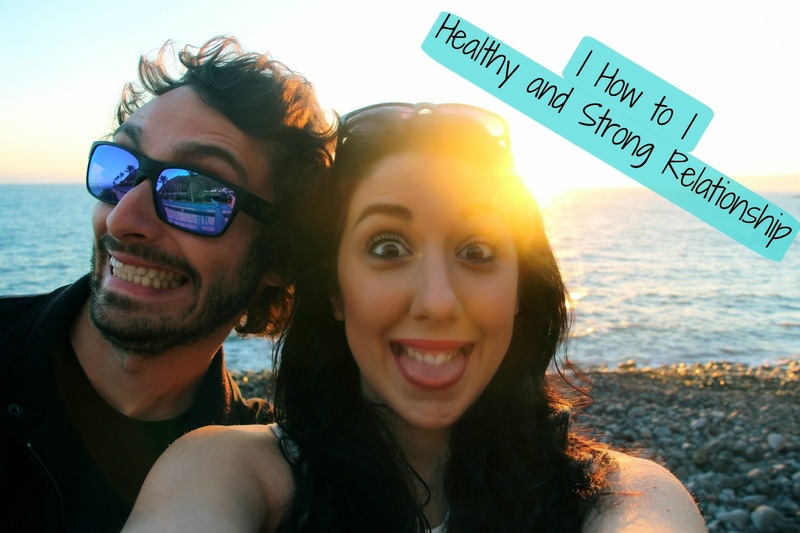 My six tips for a good, strong and healthy relationship. Believe me when I say that I don’t do all of this as often as I should but being aware of the things that we do wrong is a big step to improve a relationship, don’t you think?